PLG Series Continual Rotary Tray/Plate Dryer,Disc-type Dryer - Changzhou Fushite drying Engineering Co., Ltd.
1. The drying process can be optimized by adjusting the thickness of the layer, the spindle speed, the number of harrow/rake arms, the type and size of the harrows/rakes. 2. Each layer of drying tray/plate can be heated or cooled by heating medium or cooling medium. The material is heated evenly and the temperature control is accurate and easy. 3. The residence time of the material can be precisely adjusted. 4. 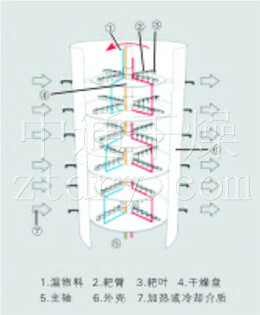 The material flow direction is single, no back mixing phenomenon, uniform drying, stable quality, no need to mix again. 1. The starting and stopping operation of the dryer is very simple. 2. After stopping the feeding, the material conveying harrows/rakes can quickly empty the materials in the dryer to the collector. 3.You can carefully clean and observe the equipment through the special large-scale inspection door window. 1. The material layer is very thin, the spindle speed is low, and the material transfer system requires less power and less power consumption. 2. Drying with conduction heat, high thermal efficiency and low energy consumption. (4) The operating environment is good, the solvent can be recovered, and the dust emission meets the requirements. 1. Normal pressure type: Because the airflow speed in the equipment is low, and the humidity distribution is denser in the upper than the lower space in the equipment , thus make it difficult for the dust powder to float to the top of the equipment, so the exhaust gas discharged from the top exhaust port contains almost no dust. 2. Sealed type: Equipped with a solvent recovery device, which can easily recover organic solvents in wet gas. The solvent recovery device is simple-structured and has a high recovery rate. For materials/substances that are flammable, explosive, toxic and easily oxidizable, nitrogen can be used as a moisture-carrying gas for closed-circuit circulation to make it safe to operate. 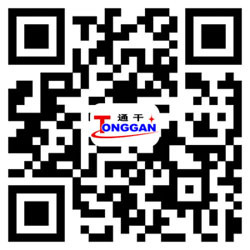 It is especially suitable for the drying of flammable, explosive and toxic materials. 3. Vacuum type: The disc dryer operated under vacuum is especially suitable for the drying of heat sensitive materials. 1. The dryer is shipped from the factory as an integral whole during the transportation. It only needs to be hoisted in place, and the installation and positioning/fixing is very easy. 2. Due to the dry-disc/trays/plates layout and vertical installation, even if the drying area is large, the floor occupancy space is relatively small. The continual/continuous rotary tray/plate/disc-type dryer is a highly efficient heat/thermal conduction type continuous drying equipment. 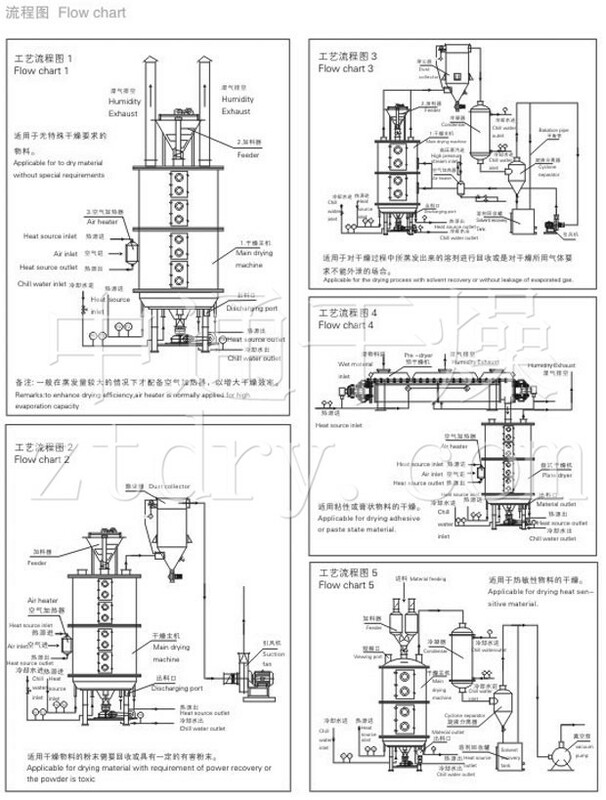 Its unique structure and working principle determine these features: its high thermal efficiency, low energy consumption, small floor area occupancy, simple configuration, convenient operation and control, and good operating environment. . It is widely used in the drying of chemical, pharmaceutical, pesticide, food, feed, agricultural and sideline products processing industries. It has been well received in practice in various industries. The continual rotary tray dryer can be divided into three types: atmospheric pressure, sealing, vacuum; 1200, 1500, 2200, 3000 and other specifications of carbon steel; A (carbon steel), B (contacting part material of stainless steel), C (on the basis of B, increase the usage of stainless steel on part of the steam pipeline, the main shaft and the bracket, the cylinder and the top cover are lined with stainless steel. The material drying area is 4~180m2, and there are hundreds of models of the series, and can be provided with auxiliary equipment. It can meet the needs of users to dry various materials. The wet material is continuously fed from the feeder to the dryer on the first layer of the drying tray, and the harrow/raking arm with the harrow/raking blades/leaves is rotated to allow the raking arm to continuously turn and stir the material. The material flows along the exponential spiral through the surface of the drying tray, and the material on the small drying tray is transferred to the outer edge, and the material on the large drying tray moves inwardly and falls from the intermediate dispensing opening into the next small drying tray. The size of the drying tray is alternately arranged up and down, and the material is continuously flowed through the entire dryer. A heating medium is introduced into the hollow drying tray. The heating medium is in the form of saturated steam, hot water and heat transfer oil. The heating medium enters from one end of the drying tray and is led out from the other end. The dried material falls from the last layer of the drying tray to the bottom layer of the casing, and is finally transferred to the discharge port by the harrows/rakes. The moisture vapor escapes from the material and is discharged by the moisture discharge port provided on the top cover, and the moisture vapor of the vacuum type disc/tray/plate dryer is extracted by the vacuum pump port provided on the top cover. 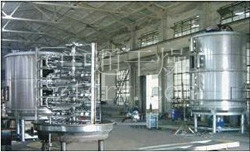 The dry material discharged from the bottom layer can be directly packaged. 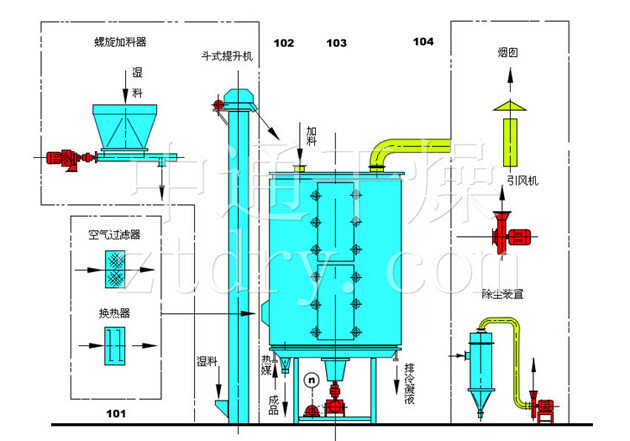 By adding finned radiator, solvent recovery condenser, bag filter, dry material back mixing mechanism, induced draft fan and other auxiliary machines, it can improve its drying production capacity of dry paste and heat sensitive materials, solvents can be easily recycled,and capable of pyrolysis and reaction operations.